“Swimming Safe From the Start” in Aurora since 2003! The Seymour family’s swimming pedigree began in Australia, where Ross’s father, Kenneth Seymour, founded the first indoor learn-to-swim center in Melbourne in 1960. The Seymour Swim School recently celebrated its 50th year of business in 2010. In 1972, Ross came to the United States to attend Oklahoma State University on a swimming scholarship. Upon graduation, and having represented his native Australia in the 1976 Olympics in Montreal, Ross became a graduate assistant swim coach at Florida State University. After earning his Masters of Science degree from Florida State, he became an assistant swim coach at the University of Tennessee. He then became the aquatics director, an assistant professor, and head men’s and women’s swimming coach at George Williams College while simultaneously serving as the head coach of Lyons Township Swim Club. 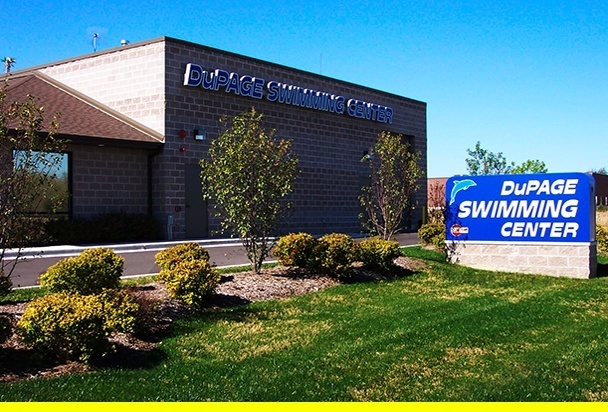 In 1983, Ross took advantage of his passion for aquatics and went into business for himself, founding Swimming Pool Management Systems, Inc. (SPMS), Pool Guards, Inc., and finally, the Du Page Swimming Center. Ross’s wife, Mina Seymour, an experienced swim coach in her own right, has spent time as a head or assistant coach in numerous organizations, including: the Swim Fast Swim Camp at George Williams College, the Lyons Township Swim Club, the Westmont Swim Club, and the St. Charles Swim Club. She was also Aquatics Director for the Boy’s Club in Knoxville, TN. Mina was an integral part of starting the family’s aquatics-based businesses, and ultimately, the creation of the Du Page Swimming Center. Ross and Mina’s daughters, Lauren Hodder and Ashley Seymour, have joined their parents following their own successful swimming careers: Lauren, as vice-president and manager of the Du Page Swimming Center, and Ashley as the vice-president of service at SPMS.